Ted Stoffer (1970, USA / BE) is a Brussels choreographer, teacher and performer. He has choreographed for Les Ballets C de la B, Norrdans, Ballet Roto and the Aphasia Dance Company, which he founded in 1997. 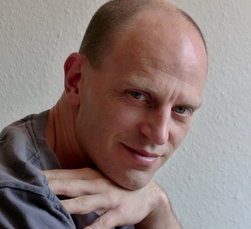 His production ‘Aphasiadisiac’ was nominated for Critics’ Awards in Belgium and is co-recipient of the Argos Critics’ Award at the Brighton Festival. His work toured Belgium, Holland, Germany, England, France, Greece, Italy and Japan and was presented at the Indianapolis Museum of Art, USA. His instructional video MENINX has been used by the BBC & the Arts Council England and around the world. For 17 years he has taught for Ultima Vez, Rosas, Charleroi Danses, Needcompany, DV8, Sasha Waltz, Ballet Marseille, Carte Blanche and other international companies, as well as at festivals like Impuls Dance, Kalamata Festival, ReAction International Artist Exchange, Hot Summer Kyoto International Festival, Istanbul Dance, B12, TanzFabrik, Summer Intensive, etc. He is also a regular teacher at leading drama schools in Germany and regularly works with award-winning director Luk Perceval. He is married to singer Sayaka Kaiwa. They have a son and a daughter.